I took Sadie back to see her old friends today. She was rescued by a non-profit adoption organization called All About Dogs (aka All Breed Rescue). 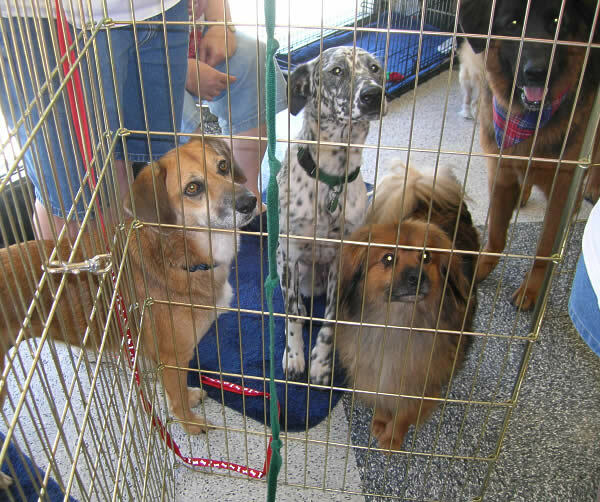 Each Saturday at Petco Tanasbourne they set up their fenced in area and show off their latest finds. Many of the dogs come from the pound and are rescued from death. All of them are special and worthy of a second chance. In most cases, dogs are not given up because of poor behavior but because of lack of commitment by owners. The statistics of how many dogs are killed each year due to overpopulation is staggering. I asked the volunteers to "recreate" the scene of seeing Sadie for the first time at Petco. She is surrounded here by some doggie pals, both old and new. Jacques (bottom-right) has been there since when I got Sadie. I'm not sure about the others. All About Dogs is a full service adoption rehabilitation facility and we will disclose our in house observations and whatever other information we have received about the dog with the adopter. Let us help you be informed about the dog you are seeking to adopt. Not all dogs are suited to all people. We temperament test all dogs that come through our rescue service. It is required (either by us or the adopter depending on the conditions of the contract) that the dog will be spayed or neutered & shots updated including rabies. We start on housebreaking & leash training while they are at our facility. Whether you need to find a new family pet to addto your home or a new home for you pet, we can help! We are a private 501 C 3 Non-Profit Organization - funded solely by our adoption fees & donations. All donations go to the medical care & rehabilitation of all the dogs in our rescue. 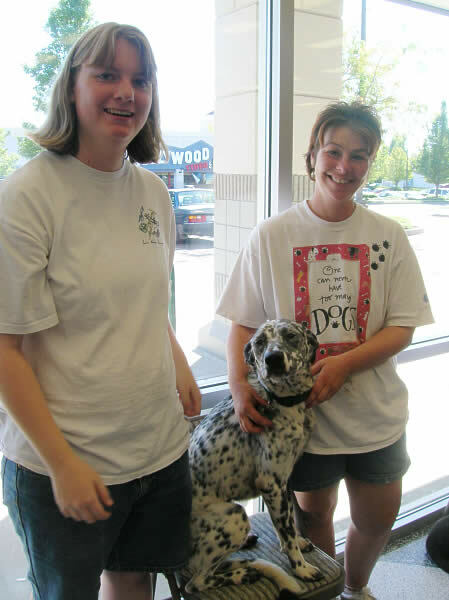 Here are two of the caring and knowledgeable ladies who volunteer with All About Dogs.